Sales to disk drive manufacturers and integrators had been our major business from the beginning until 1989. From the time I relinquished control in mid-1988 until 1990 a lot had changed. The interface to most disk drives had moved to the low cost IDE interface, SCSI was now used primarily on high cost, high capacity disk drives designed for use on workstation and file server computers. 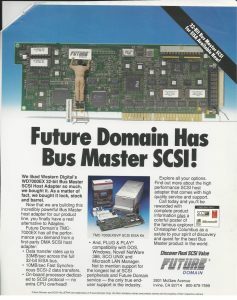 Workstations and file server designers demanded more sophisticated SCSI host adapters, ones that were called “Bus Master”. These adapters did not need the workstation processor to move the data from the disk drive to the computer RAM memory. The Bus Master Controller could control the bus and move the data by itself. By 1991 most SCSI disk drives were being sold into workstations and servers, not desktop PC’s. Desktop PC’s used the much less expensive IDE interface. Because of the infighting between Al and Tom Miller in sales, we did not develop a bus master adapter during this critical time. Western Digital and Adaptec did develop bus master adapters in 1987 and 1988 respectively. The WD 7000ASC was the first bus master adapter on the market for the 16 bit IBM PC AT bus. It quickly became very popular. Adaptec introduced the AHA-1540 in 1987. Because of Adaptec’s superior sales and marketing capability, they quickly began taking business from WD. By 1989 the AHA-1540 was outselling WD 7000 by a significant margin. Adaptec aggressively cost reduced the AHA-1540 by employing LSI technology. WD did and initial cost reduction in 1989 resulting in the WD 7000 FASST that incorporated the new fast SCSI standard, but terminated work on cost reduction after that. Adaptec cost reduced their product on a yearly schedule. In 1990 both Adaptec and WD introduced bus master products for the new EISA 32 bit bus that was standard on almost all non-IBM workstations and servers. The WD product was called the WD7000 EX FASST. WD’s main business was disk drives. The company ran into some financial difficulty, and the new CEO decided to shed non-core business. In 1991 I had refocused Future Domain’s sales and marketing strategy away from high performance SCSI hard disk to multimedia and optical disk. As a result there was disagreement in both sales and marketing. At every sales meeting the sales force gave the excuse that they could sell more our products if they had a bus master product, and Adaptec did. I did not buy this, and we had heated arguments about it. Throughout 1991 our sales continued to improve under the new strategy. I was not willing to invest in the bus master yet. First, the 16 bit AT bus master business was now a declining one. IBM machines used microchannel, and other manufacturers were using EISA bus for server computers. Fewer and fewer of these types of machines were using 16 bit AT bus. Secondly, most customers for this type of adapter had already qualified either the Adaptec or WD board. These boards were either in their second or third generation, ours would be first generation. It would be difficult for us to catch up. I did consider an EISA and MCA bus master adapter, but because of our poor sales in 1990 our resources were limited. I was not willing to take resources away from our key products to chase rainbows during the turnaround. That summer I learned that Kathy Braun, General Manager of WD, was looking to shed non-disk drive operations, including SCSI host adapters. I contacted my investment banker, Greg Presson, and he set up a meeting. Yes, they were interested in shedding the SCSI bus master adapter business, would we be interested? WD had about $2 million in recurring business for the WD 7000 FASST based on products designed into OEM systems; they had minimal distribution sales to system integrators. WD had sampled the WD 7000 EX EISA Bus Master SCSI Adapter board to OEM’s but had no design wins at that time, Adaptec had beat them at all OEM’s. WD had about a years’ worth of WD 7000 inventory worth about half a million dollars. I called a meeting of my sales team, including Mike Perez at IBM. What if we had a product like the WD 7000, and a version for the EISA bus. Could they sell it? Steve Sullivan, Madonna Saxton, Mark Zadeh were all giddy, Mike had no interest. Of course that was what they wanted. I asked for sales projections. When I got them they were very rosy. Fifty percent plus sales increases in 90 days! Having been through this before, I was skeptical. I asked the sales team to identify specific customers. They came back this time with a much more conservative estimate. OEM customers said that they most likely would not switch from Adaptec for 16 bit product, but would be willing to evaluate the EISA product. Many told my OEM sales team that they had already evaluated the WD 7000EX and had decided to stick with the Adaptec EISA product. Madonna Saxton who was my Distribution sales manager told me after going back and having serious discussions with our distributors that Adaptec owned that market, and they could not see Future Domain having much of an impact with the WD products in distribution. However she was still interested in the product. Based on this feedback, I told my sales team we would not invest in the 16 bit WD 7000 AT Bus product. WD had existing contracts for the WD 7000 which we would service and continue to manufacture boards for. On the EISA side I told them that I would support and promote the WD 7000EX product and begin a preliminary cost reduction engineering program for six months. If we did not have at least $1 million in new sales booked for the EISA product by then I would pull the plug on cost reduction. I warned them they would find selling this type of adapter much harder than they thought. I went back to WD, and we bought the SCSI host adapter product line for the cost of the inventory, about half a million dollars. We had about two million dollars in sales locked in for the next year based on existing WD customer base, so this would be a profitable venture for us. I was reinvesting some of those profits in the effort to sell the EISA adapter, the 7000 EX, but I put a cap on what I would spend until the sales people could prove themselves. If they brought a strong OEM customer like Dell, Compaq or HP I would increase funding to speed up development. So the next three quarters sales tried to sell bus master. One additional complication developed, a new company, Bustek based in San Jose, began selling an Adaptec plug in replacement Bus Master Adapter at a lower cost. This gave OEM customers a second source, which they always love to have. My sales people came back to me with their tails between their legs. In nine months they did not have a single design win. They did not realize that our product lines had a lock on our market segments. They only had to go into a vendor looking for a multimedia solution and pick up the order. All the CD-ROM manufacturers recommended us as the only solution that worked. Since we were manufacturing IBM SCSI cards vendors that needed to be IBM compatible had to choose us. The 7000 EX had none of these advantages, our sales people had to slug it out in the marketplace, and as soon as it got tough, they ran back to the comfort zone. Many of our customers also had server groups that used the Adaptec products so my sales people thought it would be easy to knock Adaptec off. I even agreed to beat Adaptec’s price, even though we had not cost reduced the product and thus would lose money on every sale. Since Adaptec did have a product that did compete with ours occasionally we would lose a sale because Adaptec “bundled” multimedia adapters with a bus master design win. This was frustrating, and our sales people wanted to counter it with the WD product. Unfortunately the WD product was not superior enough to the Adaptec product to entice an OEM to incur the cost to switch vendors. We did sell several hundred 7000EX adapters through distribution with the “Disk Maestro” and later “PowerSCSI” software which I had engineering port to the 7000 EX. I could have pushed sales harder on the 7000 EX, but I could see the end of the EISA bus, and even MCA bus coming. By the end of 1991 our sales of SCSI host adapters was $1.2 million a month. The best year WD had for SCSI host adapters was 1989 and sales were just over $600,000 a month. When we bought the WD product sales were only $160,000 a month and declining. Sales of the WD product continued to decline during this period, yet sales of Future Domain product increased 50%. We were on our way to almost $16 million in sales. I used this lesson to drive home a very important lesson to our OEM sales people; the grass is always greener on the other side of the fence. We featured the 7000EX product at COMDEX and in advertising in 1992 and 1993, but sales were minimal without OEM design wins. 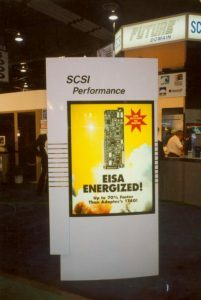 We discontinued the product in 1994 when the EISA bus disappeared and PCI came into favor. After 1993 I did not hear any complaints about our products and the fact we chose to only compete in market segments we could dominate. We continued to sell the WD 16 bit product into 1995, but only to the existing customer base. It was a small, yet profitable niche for us. And of course it allowed the sales people to at least feel good we had such a product if a customer asked. After nine months we terminated any engineering development of a follow on WD 7000 EX product, but continued to support the existing WD 7000 FASST customer base. When the PCI bus came out in 1994 several of those customers changed to our 32 bit PCI product. If we were going to compete in the Bus Master Host adapter business, we needed a product that leapfrogged Adaptec, Bustek and others. What that meant to me is that we needed a 32 bit product that worked with the new bus architectures on both the system side and the IO bus side, but what were the correct choices? It was clear to me that PCI was going to be the bus of choice for future PC’s and servers. On the IO side there was no consensus. IBM was promoting Serial Storage Architecture (SSA) and was inviting us to work with them. Adaptec and others wanted to stick with SCSI, but increase the bus width to 16, even 32 bits. IDE was reincarnated as ATA and later SATA and promotors of that low cost interconnection technology were expanding it to support devices other than fixed disk drives. Others wanted to move to fiber optics, a technology called Fiber Channel and there were other proposals. The right choice could leapfrog our competitors, but the wrong one could kill the company. The path forward was not clear or obvious. This created concern not only at Future Domain, but Adaptec and others. Each company dealt with this uncertainty in different ways.